Color is one of the formal construction elements and expressive dimension of the built environment, and is significant through the interaction of a group of actors in the formal construction to him, was reflected in the trends and theories of contemporary architecture. However, the architecture of Iraq have suffered and still suffer from poverty chromatic and clear as a result of lack of familiarity with the science-based accredited in building the color, which called for "clarifying the nature of the actors in the process of building the color of the structure of communication in architecture in general and architecture Iraqi traditional and contemporary, in particular" to represent the research problem. The research aims to "to reveal the actors in the process of building a color as a means of communication can verify that the privacy of the color composition of Iraq's contemporary architecture." Research was to study aspects of synthetic and analytical to the color as a communication with a view to determining the nature of its structure in architecture Iraqi accordance with the questionnaire prepared for that as a tool for testing, research found to identify the most important elements of building color in architecture traditional Iraqi and how it relates to the specificity determinants of the natural and cultural rights to be taken into account when study of any system for the color of the buildings that can communicate with any orientation of the building within the concept of Iraqi contemporary civilization. يعد اللون احد عناصر البناء الشكلي والبعد التعبيري للبيئة المبنية، ويشكل دلالته من خلال تفاعل مجموعة من العناصر المؤثرة في البناء الشكلي له، وقد تجسد ذلك في توجهات العمارة ونظرياتها المعاصرة. إلا إن العمارة العراقية عانت وما زالت تعاني من فقر لوني واضح نتيجةً لعدم الإلمام بالأسس العلمية المعتمدة في بناء اللون، مما دعا إلى " توضيح طبيعة العناصر الفاعلة في عملية بناء اللون من خلال بُنيته الاتصالية في العمارة بصورة عامة والعمارة العراقية التقليدية والمعاصرة بصورة خاصة" لتمثل مشكلة البحث. ويهدف البحث إلى" الكشف عن العناصر الفاعلة في عملية بناء اللون كوسيلة اتصالية يُمكنها من إن تحقق خصوصية التشكيل اللوني للعمارة العراقية المعاصرة"، مفترضا اختلاف عملية بناء اللون بتنوع محددات بُنيته الاتصالية في العمارة العراقية. اعتمد البحث على دراسة الجوانب التركيبية والتحليلية للون كوسيلة اتصالية بهدف التوصل إلى تحديد طبيعة بنيته في العمارة العراقية على وفق استمارة الاستبيان التي أعدت لذلك كأداة للاختبار، خلص البحث إلى تحديد أهم عناصر البناء اللوني في العمارة العراقية التقليدية ومدى ارتباطها بخصوصية المحددات الطبيعية والثقافية الواجب مراعاتها عند دراسة أي منظومة لونية للأبنية يمكن إن تتواصل مع أي توجه للعمارة العراقية ضمن مفهوم حضاري معاصر. Abstract Numerous waste materials result from manufacturing operations in industries. The purpose of this study was to investigate the effect of these waste materials on physical properties of asphalt cement and on surface layer of hot mix asphalt pavement. Asphalt cement with penetration grade (40-50) and 19 mm aggregate maximum size gradation is used in this study with Optimum asphalt content 4.9 %. at the desired temperature of (25˚C).Two types of waste materials crushed glass and sawyer wood (both retained on sieve no. 200) with four percentages (0%, 3%, 6%, and 9% by weight of total aggregate) are used. The mixes are tested by using creep test. From the experimental work, it can be seen that more benefits when additive waste glass or sawyer wood luck improved mechanical (physical) and rheological properties for asphalt paving mixture. توجد العديد من المخلفات التي تنتج من عمليات التصنيع في المصانع. في هذا البحث تم دراسة تاثير اضافة نوعان من هذه المخلفات وهو الزجاج المطحون ونشارة الخشب على الخصائص الفيزيائية للمادة الاسفلتية ومدى تاثيرها على الطبقة السطحية للتبليط الاسفلتي. في الخلطة الاسفلتية تم استخدام اسفلت ذو درجة اختراق (40-50) ومقاس اقصى للركام 19 ملم وبنسبة اسفلت مثلى 4.9% وبحرارة 25˚Cوباربع نسب مضافات من هذه المخلفات 0% ،3% ، 6% و9% من الوزن الكلي للخلطة. تم فحص هذه النماذج باستخدام فحص الزحف. من خلال هذا البحث تم التوصل الى ان استخدام هذه المخلفات يحسن الخواص الفيزيائية والريولوجية للخلطات الاسفلتية. In this paper, the optimization and increasing of the stiffness of squareplate, numerical simulation of laminate composite plate using genetic algorithms with finite difference analyses, in which applied to the design variables of the objective functions of the stacking sequence are studied. The plates have been evaluated with actual condition of problem such as distributed load,under simply supported boundary condition with different number of layers (5, 10, 20, 30, 50) and different stiffness ratios (E1/E2) 5, 10, 20, 30, 50. The effects of fiber orientation, number of layers and stiffness ratios on the deflection and stress response of symmetric of classical laminated composite plate subjected to uniformly pressure load (flexural loading) are presented. The maximum deflection and stress are the major parameters that were taken into account in the plate design. Then obtain the optimal suitable stacking sequence orientation of composite plate that gives a small maximum deflection and maximum stress of central point of the plate which represent the main aim in this work. 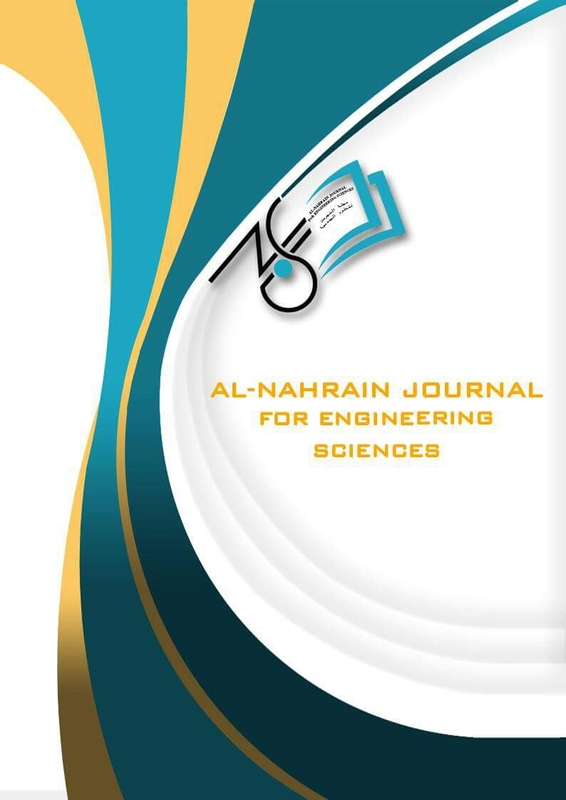 The results were compared with ANSYS software results and obtain a good agreement.في هذا البحث، ان تحقيق الامثلية مع زيادة صلابة الصفيحة المربعة، حيث ان المحاكاة العددية للصفيحة الرقائقية المركبة باستخدام الخوارزميات الوراثية مع تحليلات الفروقات المحددة, والمطبقة على متغيرات التصميم للدالات الموضوعية على زاوية دوران الطبقات المدروسة. الصفيحة تم تقييمها بالاسلوب الفعلي للمشكلة مثل الحمل الموزع، تحت شرط حد التدعيم البسيط مع اختلاف عدد الطبقات (5، 10، 20، 30، 50) واختلاف نسب الصلابة (5، 10، 20، 30،50). ان تاثير زاوية دوران الفايبر، عدد الطبقات، ونسب الصلابة على التشوه واستجابة الاجهاد للصفيحة الرقائقية المركبة الكلاسيكية المركبة المتناظرة الخاضعة لحمل الضغط المنتظم (حمل الانحناء). ان التشوه والاجهاد الكبيرين هما احدى العناصر الرئيسية التي تؤخذ بنظر الاعتبار عند تصميم الصفيحة. وبعد ذلك يتم الحصول على امثل وانسب زوايا دوران للصفيحة المركبة والتي تعطي اقل اكبر تشوه واقل اكبر اجهاد لنقطة المنتصف للصفيحة والتي تمثل الهدف الرئيسي لهذا العمل. النتائج تم مقارنتها مع نتائج برنامج الانسيز وتم الحصول على تقارب جيد. The characteristics of polymer materials which are containing ceramic particles has been investigated to find the information and data to give good expectation for composite behavior under fatigue damage. In this research epoxy resin reinforced by ceramic particles (Alumina, silicon carbide and graphite), with reinforcement particles size range between 36 and 45 Micrometer and 1 to 10 micrometer for graphite. The structure has been investigated under stress-strain and fatigue damage to evaluate the bound strength between the matrix and reinforcement phase. This examinations lead to discover new Techniques which is applied during preparation of the composite materials. Basically this methodology will reduce the porosity which develops during mixing and solidification process, as a result the bound strength between the polymer and the reinforcement will increase in another word the properties of the composite improve. The fatigue damage in the composites is complex because, it is combine between several damages, first matrix cracking and second debonding of the particles. The fatigue damage shows that pure epoxy give initial stress (26.2) MPa and its final failure is at 221 hundred thousand cycles in which the stress indicated is to be equal to 20 MPa. for the composite contain epoxy with aluminand slicon carbide, the initial stress is equal to (32.2) MPa and its final failure is at 910 hundred thousand cycles in which the stress indicated is to be equal to 23 MPa. In the case of graphite reinforcement it is clear there is reduction in the value of maximum stress. The microstructure examination shows that the cracks stop at the reinforcement particles or goes around them. Crack propagation is thereby inhibited. This means that the fracture toughness of the composite increased إنّ خصائصَ موادِ Polymer التي تَحتوي جزيئاتَ خزفيةَ درست لإيجاد المعلوماتِ والبياناتِ لإعْطاء التوقّعِات الجيدِة لسلوكِ المواد المركّبِة تحت اختبار الإعياءِ. في هذا بحثِ Epoxy لقد عزّزَ بالجزيئاتِ الخزفيةِ (أوكسيد ألمنيوم وكربيد وسيليكونِ وجرافايتِ)، بمدى حجمِ يتراوح بين 36-45 ميكرومترِ و1-10 ميكرومترِ للكرافايت . حيث ان التركيب فحص تحت إجهادِ واختبار الإعياءِ لتَقييم قوّةِ الترابط بين مرحلةِ التعزيزَ والمصفوفةَ بحيث ان هذه الفحوصِ تُؤدّي إلى اكتشاف تقنيات جديدةَ التي تطبق أثناء تحضيرِ الموادِ المركّبةِ. وبصورة اساسية ان هذا عِلْمِ المنهج سَيُخفّضُ المساميةَ التي تُطوّرُ أثناء عمليةِ الخَلْط والتصليد. كنتيجة قوّة الترابط بين Polymer والتعزيز سَتَزِيد من خصائص تحسين المركب. اختبار الإعياءَ في المركّباتِ يكون معقّد لأنها تتركب بين عِدّة أضرار، أولاً تكسر المصفوفة وثانياً إلتِصاق الجزيئاتِ. اختبار الإعياءَ في Epoxy الصافي يَعطي إجهاداً أولياً مقدارة MPa(26.2) وفشله النهائي في 221 مائة ألف دورة الذي فيه الإجهادِ سَيصْبَحُ مساويَ إلى MPa 20 بينما مركّبِ يَحتوي with ALUMINAND SLICON CARBIDE EPOXY ، الإجهاد الأولي مساويُ إلى MPa (29.2) وفشله النهائي في 910 مائة ألف دورة الذي فيه الإجهادِ سَيصْبَحُ مساويَ إلى MPa 23 . في حالة تعزيز الجرافايتِ من الواضحُ ان هناك تخفيض في قيمةِ الإجهادِ الأقصى. الفحصَ المجهري يبين بأنّ الشقوقَ تَتوقّفُ عند جزيئاتِ التعزيزَ أَو يحيط بهما. وبهذا نمنع انتشار التشقق وهذا يَعْني بأنّ المقاومة ضد الكسرَ قد زادتْ في المركبات. The mechanical properties of commercial epoxide resin type conipox 77Z have been investigated both unfilled and filled with varying weight fraction of copper particles. The values of Young’s modulus, modulus of rigidity, yield stress, tensile strength, shear strength, flexural strength, fracture energy, impact strength, coefficient of friction and the S/N curves and the fatigue strength or fatigue limit have been studied at room temperature (25°C) to a certain the influence of weight fraction of copper powder to epoxy resin (0%, 5%, 10% and 15%) and found that increasing the weight fraction of copper powder to epoxy for different particle sizes leads to an increase in modulus of elasticity (E), modulus of rigidity (G), tensile yield stress and ultimate tensile strength but at the same time will decrease the compression yield stress, fracture energy and the impact strength. Finally the reinforced epoxy with (15%) was found to be improving the mechanical properties for composite material, where the modulus of elasticity and the modulus of rigidity increased and the coefficient of friction of the composite material to steel decreased. الخواص الميكانيكية لراتنج الايبوكسي التجاري conipox 77 قد درست في حالة التدعيم بدقائق النحاس بكسور وزنية مختلفة وفي حالة عدم التدعيم. قيم معامل المرونة,معامل الجساءة, اجهاد الخضوع, اجهاد الشد, اجهاد القص, اجهاد الانحناء, طاقة الكسر, مقاومة الصدمة, معامل الاحتكاك, منحنى S/N و اجهاد الكلل قد درست عند درجة حرارة الغرفة (25س) لمعرفة تاثيرالكسر الوزني لمسحوق النحاس الضافة الى الايبوكسي بمقادير (0%,5%,10% و15%). ووجد ان الزيادة في الكسر الوزني لمسحوق النحاس الى الايبوكسي و لاحجام مختلفة لجزيئات النحاس قد ادت الى زيادة في معامل المرونة,الجساءة,اجهاد الخضوع, اجهاد الاقصى ولكن في نفس الوقت ادت الى تقليل اجهاد الخضوع , طاقة الكسر و طاقة الصدمة. اخيرا الايبوكسي المدعم بنسبة (15%) ادى الى تحسين الخواص الميكانيكية للمواد المركبة مع تقليل لمعامل الاحتكاك. "نمذجة توزيع ألاوكسجين المذاب في المفاعل ألاحيائي (البايولوجي) الثلاثي الطور"
A mathematical model for a slurry bioreactor was proposed to describe oxygen utilization rate and concentration profiles along the reactor for reactants and products in the bubbly flow regime. The model consisted of transient differential equations representing mass transfer and kinetics of oxygen, biomass and substrates in the liquid phase. The model was validated by comparing with experimental work of other authors and a good agreement was obtained, the absolute average error between model and experimental results was 4.3%. The effects of various operating parameters on the concentration profile of oxygen and biomass were investigated theoretically. The dissolved oxygen concentration was significantly affected by the superficial liquid velocity than that by superficial gas velocity. Unsteady state concentration profile of oxygen showed different behaviors gas and liquid. يهتم البحث يايجاد موديل رياضي للتنبؤ بتراكيز الاوكسجين المذاب والمواد المتفاعلة الاخرى والمنتجة على الامتداد الطولي للمفاعل البايولوجي الثلاثي الطور الذي يعمل عند نظام الجريان المتجانس ((Bubbly Flow Regime . و يتكون الموديل من معادلات تفاضلية لتوازن الكتلة مع ادخال قانون معدل سرعة التفاعل لكل مادة من المواد المتفاعلة عند الحالة غير المستقرة (transient state). ولتأكيد موثوقية الموديل تحت مقارنة نتائج الموديل مع نتائج عملية عند نفس الظروف التشغيلية و اعطت المقارنة معدل انحراف لايزيد عن% 4.3. واوضح الموديل كيفية تأثير الظروف التشغيلية (سرعة الغاز والسائل) على تركيز المواد المتفاعلة و المنتجة على امتداد المفاعل حيث ان سرعة السائل لها تأثير اكبر من سرعة الغاز على معدل تغير التراكيز. كما استخدم الموديل لبيان تغير التراكيز عند الحالة غير المستقرة. Among various coating systems for industrial and engineering applications, glass–ceramic coatings have advantages of chemical inertness, high temperature stability and superior mechanical properties such as abrasion, impact etc as compared to other coating materials. Besides imparting required functional properties such as heat, abrasion and corrosion resistance to suit particular end use requirements, the glass–ceramic coatings in general also provide good adherence, defect free surface and refractoriness. This research tends to produce a cheep and effective glass- ceramic coating from glass cullet and different percent of crystallization agents ZrO2, and study the final corrosion resistance properties of them. After several set of acid resistance testing at temperatures range (25, 50, 75,100,125 oC) it has been found that porcelain enamel with (4 wt %) ZrO2 has the best acid corrosion resistance. من ضمن انظمة الطلاء المختلفة للتطبيقات الهندسية والصناعية, طلاءات الزجاج السيراميكي لها ميزة المقاومة الكيميائية, والاستقرارية في درجات الحرارة العالية والخواص الكيميائية المدهشة مثل القشط, والصدمة الى اخره مقارنة مع مواد الطلاء الاخرى. اضافة الى باقي الخواص الضرورية للاغراض التطبيقية مثل الحرارة , مقاومة القشط , والتاكل لتلائم متطلبات التطبيق النهائية, طلاءات الزجاج السيراميكي بصورة عامة توفر التصاقية جيدة وسطح خالي من العيوب وعازل حراريا. هذا البحث يهدف الى انتاج طلاء من الزجاج السيراميكي يكون فعالا ومنتج من مخلفات الزجاج ونسب مختلفة من عامل التبلور ZrO2, ودراسة خواص مقاومة التاكل النهائية. بعد سلسلة متعددة من اختبارات مقاومة الحامض في درجات حرارية تتراوح بين (25, 50, 75,100,125 oC) وجد ان الطلاء ذو (4% نسبة وزنية) من ZrO2 له احسن مقاومة تاكل. One of the major limitations with the authentication of users via the internet is the inherent lack of security of traditional authentication techniques, passwords, PIN numbers and cookies. With the current development of the biometric fingerprint technology market, the possibility of identifying someone online has been addressed. However, recent publication in this field shows that the lack of aliveness detection mechanism in fingerprint sensors technology, may be used to mold and reproduce exact copy of a fingerprint with its detailed shape and extended characteristics (e.g. minutiae points’ location). The presented authentication system provides the solution to this problem by using ID-based cryptography. A complete online authentication system is developed presenting the registration, login and authentication phases. The security analysis of the system is also presented.واحدة من أهم القيود المتعلقة بتوثيق المستخدمين عن طريق الانترنت هو افتقار تقنيات التوثيق التقليدية ,كلمات السر ,أرقام التعريف الشخصي و cookies لمستوى الامنيه المطلوب في التوثيق. مع التطور الحالي لتكنولوجيا البصمات الحيوية ، فان إمكانية تعريف شخص ما على الانترنت قد تمت معالجتها. ومع ذلك ، نشر مؤخرا في هذا المجال على أن عدم وجود آلية الكشف عن aliveness البصمات في أجهزة الاستشعار والتكنولوجيا ،فان ذلك يمكن استخدامه لتشكيل وإنتاج نسخة مطابقة لبصمات الأصابع مع شكلها وخصائصها التفصيلية الموسعة.نظام التوثيق المقدم يوفر الحل باستخدامه لنظام التشفير بواسطة الهوية.النظام يقدم مراحل التوثيق الشاملة مرحلة التسجيل ,تسجيل الدخول و التوثيق .تحليل النظام ايضا" مقدم . Recently, there is an increasing interest on quantum well (QW) semiconductor optical amplifier in optical communications and optical signal processing applications. This paper addresses the dependence of saturation power on QW structure parameters. Expressions are given to assess this dependency and the results indicate that the saturation power is a decreasing function of number of wells, well thickness, and amplifier length and it is almost independent of barrier thickness.هنالك اهتمام كبير بأستخدام المضخم شبه الموصل البصريSOA) ) ذو البئر الكمي (QW) في تطبيقات الأتصالات البصريه و معالجة الاشاره بصرياً. يدرس هذا البحث اعتمادية القدرة المشبعة على معالم بناء البئر الكمي لمضخم .اعطيت تعابير لتقييم هذه الاعتمادية وتشير النتائج ان القدرة المشبعة هي دالة متناقصة لعدد الابار وسمك البئر وطول المضخم وفي اغلب الاحيان لاتعتمد على سمك الحاجز.